for $379,900 with 4 bedrooms and 2 full baths, 1 half bath. This 2,750 square foot home was built in 1979 on a lot size of 0.48 Acre(s). This Sherwood Forest beauty sits on an almost 1/2 acre lot backing to the woods. 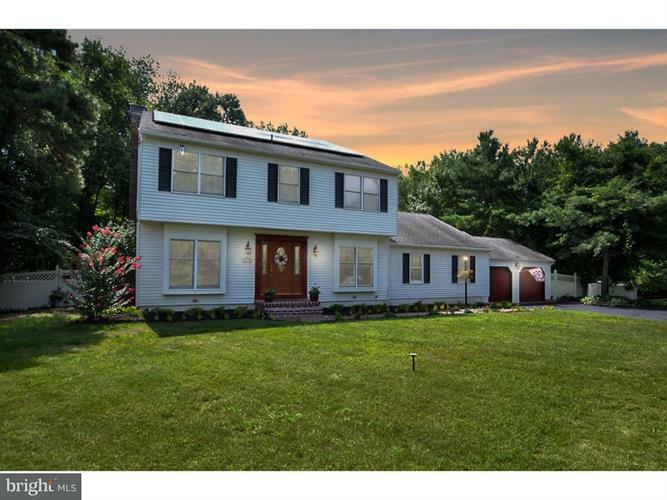 The newly paved cul de sac location of this lovely home features 4 bedrooms, 2 1/2 baths, updated custom kitchen, 2 family rooms, hardwood flooring throughout most of the home, screened in porch, leased solar panels to help reduce utility bills and so much more. Brand new high efficiency HVAC unit and hot water heater recently installed. The custom kitchen boasts cherry cabinets, granite counter-tops, stainless steel appliances, and several custom built niches including a desk/home office and server with lots of storage. The kitchen is open to the family room where you will find more custom built in cabinets surrounding the fireplace. Off the family room is a lovely screened in porch to relax and enjoy the sounds of nature from the over-sized fully fenced backyard and wooded area behind. The yard features a paved patio, gazebo cooking area, play set, shed and beautiful perennial gardens. So much space to entertain or enjoy a lazy afternoon on the patio or quiet evening on the porch. Back inside on the main level is another large family/media room with lots of closet space, formal living room, dining room, laundry room and half bath. There is also a small bonus room off the family room which is an excellent place to work from home, do crafts or make it "homework central!" The second floor features a master bedroom with its own full bath and 3 other nicely sized bedrooms and an additional full bathroom. The home is being sold "as-is" due to the owners completing a home inspection and repairs with previous buyers. They are offering a 1 year home warranty with acceptable offer. Medford is known for its highly ranked school system, quaint town and close proximity to Philadelphia. The community of Sherwood Forest offers 2 lakes, great for swimming and fishing in the summer and ice skating in the winter months. There are beach and picnic areas complete with a gazebo for cooking and hosting barbecues, and gatherings. In addition to the already fabulous amenities there is a local swim club within walking distance and also basketball and tennis courts. The neighborhood has trails for exploring and is wonderful for dog walking. There are many seasonal happenings throughout the year. Don't miss your opportunity to become part of Sherwood Forest and all it has to offer.